The iPhone case market is flooded with options. That’s a great thing for consumers, but something of a challenge if you’re trying to eke out a living making cases. How on earth can designers make a case that stands out from the ever-growing crowd? Every trade show tends to reveal a trend in the case market, where manufacturers are trying to anticipate what customers are looking for. Last year at Macworld/iWorld, we saw a lot of ultra-rugged protective cases that practically doubled the size of the svelte iPhone—ideal for deep-sea divers and extreme outdoors fanatics, but an approach that severely compromises the iPhone's style. It seemed like there were fewer cases at Macworld/iWorld this year compared to the 2013 edition, perhaps because last year’s show followed the debut of the iPhone 5, which was a new body style. The next version of the iPhone is expected to arrive later this year, so it’s possible that case makers are holding off on showing anything new. From what was on hand this year, the focus seems to be less on extreme protection and more on extra features and functionality. Slide to answer a call without lifting up the front cover. My favorite case at the show was Moshi’s $45 SenseCover, a super slim folio-style case for the iPhone 5 and 5s. Personally, I like folio cases for the iPhone because that means my display is always covered when not in use, which helps to eliminate scratches. However, many people find talking on the phone to be a bit awkward with a folio case, as you have to flip the cover around and hold it open. The SenseCover cleverly fixes that problem. The cover has a window on the front to show the time, and a touch-sensitive sensor along the bottom. When you get an incoming call, you can see who is calling through the window, and the sensor is perfectly aligned with the iPhone’s slide-to-answer area. Slide your finger along the sensor to answer the call, all without opening the cover. 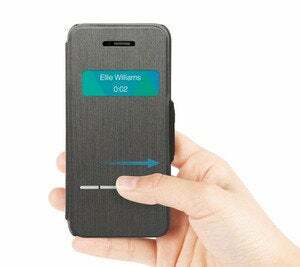 You can even talk on the phone with the front flap closed, as the SenseCover doesn’t block the microphone or speaker. Plus, it’s made from an ultra sleek, ultra slim material that really compliments the iPhone’s style. Search for heat loss spots to make your home more energy efficient with the Flir One. 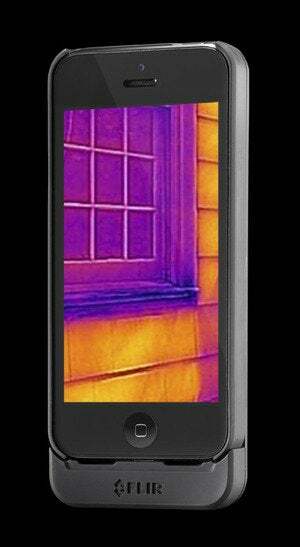 One of Macworld’s Best of Show winners was the $349 Flir One, which is a case for the iPhone 5 and 5s that doubles as a thermal imaging camera when paired with its companion app. Though that seems a little niche, it actually can be used for a bunch of practical household uses: you can look for sources of heat loss or missing insulation, locate studs in the wall, or look for moisture leaks. I also had a lot of fun playing with the $45 In1 Case, which is a multitool utility case for the iPhone 5 and 5s. (I keep referring to it as the Swiss Army Knife case, but maybe that’s a little inaccurate.) The In1 Case has eight tools tucked inside the back cover: Two pens (one in red ink, one in blue ink), a Phillips screwdriver, a slotted screwdriver, a nail file, tweezers, little scissors, and a toothpick. It also has a build-in kickstand as an added bonus. The tools are easy to slide out when you need to use one, but stay securely in place when you don’t. Tiny scissors! Two pens! Two screwdrivers! All in one case. Because each tool is smaller than 4-inches, the In1 Case is fully TSA compliant, so you don’t have to worry about flying with this bad boy. Of course, not everyone needs to search for animals in complete darkness or have a Phillips head screwdriver on them at all times. 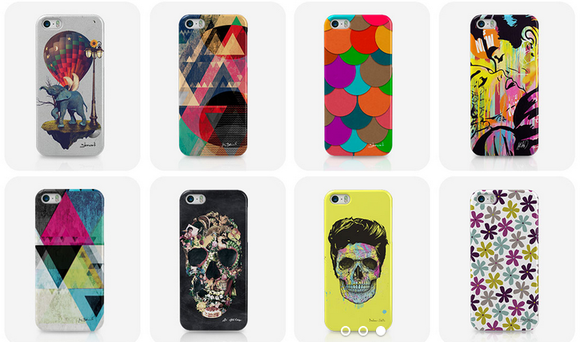 For basic protection in a colorful array of patterns, Artscase offers a ton of options. When all you want is a splash of color, Artscase has you covered. Artscase features cases designed by artists from around the world, and you can choose the level of protection you’d like: A simple hard shell starts at $29, or you can add an inner layer of silicone for double protection at $39. If you don’t see a design you like, you can create your own case, too.